Švejk Restaurant is a traditional Czech restaurant serving staples such as roast pork with sauerkraut and dumplings, beef sirloin with dumplings and a traditional Czech vegetable sauce, pork or chicken schnitzel, pork knee with mustard and horseradish, goose leg with cabbage, roasted duck, etc. It is located downtown, not right in the tourist area but close enough. It is in fact just two doors down from the iconic U Fleků brewpub. The restaurant’s interior is nicely decorated and the service is efficient, friendly, and multilingual. Švejk is not a fully gluten free restaurant but they have a separate gluten free menu and guarantee no cross contamination in their kitchen. A large part of their customers are celiacs. If you order a gluten free meal, it will be prepared separately and brought out with a little “gluten free” flag sticking up from your plate. They even offer gluten free bread and dumplings. You can choose between two kinds of gluten free beer to have a real Czech dining experience – the lighter Celia and heavier Bernard. Gluten free desserts are also available. As is typical in a Czech restaurant, the menu is heavy on meat. Vegetarians will find only a few options, such as fried cheese with French fries, spaghetti (the spaghetti aglio olio can be very heavy on chili peppers) or a potato pancake with sauerkraut. 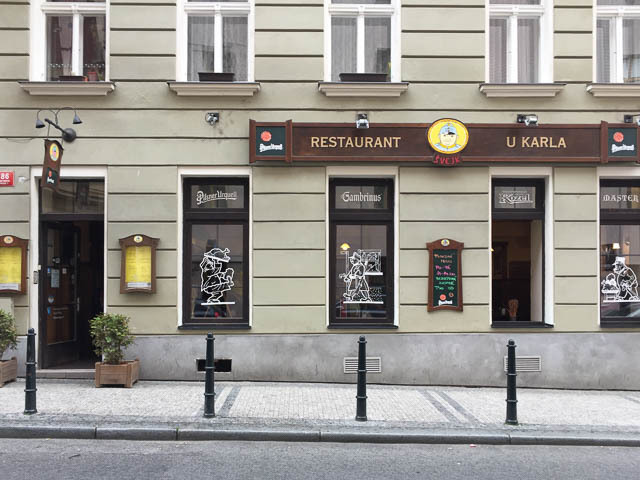 We think Švejk Restaurant U Karla is a good and safe option for celiacs. It is wonderful to have a restaurant in Prague where celiacs and those with gluten intolerance can try our national staples. Time: Monday to Saturday 11 a.m. - midnight, Sunday 11 a.m. - 10 p.m.